After a mystifying period of absence, Kirby is currently enjoying a well overdue return to Nintendo’s ever luminous spotlight. Fresh from his critically acclaimed, yarn-based jaunt through Patch Land, the loveable pink ball is soon set to grace the Wii once more, as Nintendo serve up a further helping of Kirby goodness that is headed your way later this year. Kirby Wii, its finalised title recently rumoured to be ‘Kirby Returns to Dream Land,’ seems to tread the same path undertaken for 2009 smash-hit New Super Mario Bros. Wii, introducing the ability for up to four players to join forces as they tackle a series of distinctly, characterised landscapes. However whilst the concept initially felt familiar, beyond the colourful exterior lies a deceptive level of challenge – something that I’m sure will be welcomed by fans following the relative ease of Kirby’s Epic Yarn. A number of minor touches also certainly add to the overall charm of this latest Kirby title. Players are able to hug each other to replenish health, whereas you’re also freely able to hop on the back of your co-op partner in an effort to make them piggy back you through the rest of the level! Despite the addition of Meta Knight, King Dedede and Waddle Dee, Kirby, as can be perhaps expected, remains to play the most fundamental role within the game. The return of his ‘Copy Ability’ provides the opportunity to vacuum an array of power-ups that serve to expand Kirby’s predominantly suction based capabilities – examples in the demo including a Sword, Whip and Magical Wand. These are then each enhanced through a ‘Super’ form, in which Kirby is able to utilise a certain amount of power granted to him by inhaling special enemy characters. 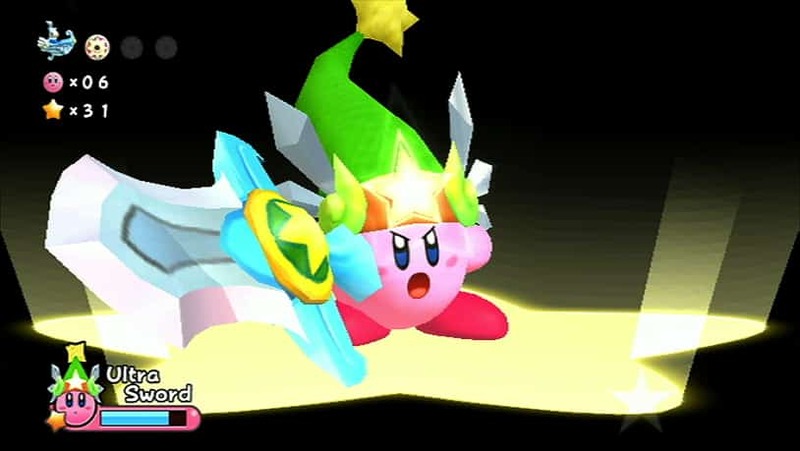 The easiest example of which is the ‘Super Sword,’ that enables you to neutralise all enemies currently present on the screen – a short animation depicting Kirby performing such actions. Such abilities also prove useful for overcoming platform challenges, including slicing thick rope to allow blocks to full and prevent cannons from firing flaming balls of death at you. However this also becomes a cause for concern, with Kirby being the only character capable of gaining such abilities to then utilise them. Meta Knight, King Dedede and Waddle Dee all find themselves equipped with their respective individual weaponry (Sword, Hammer and Spear) yet they are limited to both a basic and special attack. This therefore means in co-operative play, that the focus still seemingly remains on Kirby taking centre stage and soon becoming an overtly dominant character. Still, we’ll have to wait to see how the finalised game shapes up over the coming months, but in any case this latest Kirby offering is set to provide a hugely enjoyable experience that is incredibly worthy of being firmly fixed on your gaming radar. I just hope this game won’t be as easy as the N64 Crystal Shards was. But as I can see from now, it’s perfect.